European Antennas has launched six new base station sector antennas covering the 3.4 to 3.6GHz band to meet demand created by increasing use of the 3.5GHz band for FRA (Fixed Radio Access) applications. These antennas will complement existing vertically polarised 10dBi gain omni antennas with zero or 2 degree electrical down-tilt, that have been used in world-wide WLL applications. These new antennas feature null-fill below the horizon that, combined with a fixed electrical down-tilt of 2 degrees, enables operators to optimise coverage and maximise their revenue. Low azimuth side lobes allow efficient frequency re-use in high capacity areas. 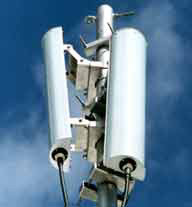 The antennas have up to 17dBi gain and comprise, 60 degree, 120 degree and 180 degree sector coverage with either vertical or horizontal polarisation. All antennas comply with ETSI specifications for co-polar and cross-polar radiation patterns. They are housed in a robust structure, designed and tested to operate in harsh environments, withstanding temperatures within -30 to +60 degrees Celsius.